University of Alberta Press, 9780888646736, 300pp. For 18 months during World War II, the Canadian military interned 1,145 prisoners of war in Red Rock, Ontario (about 100 kilometres northeast of Thunder Bay). "Camp R" held an unlikely assortment of German prisoners: Nazis, anti-Nazis, Jews, soldiers, merchant seamen, and refugees whom Britain feared might comprise Hitler's rumoured "fifth column" of alien enemies residing within the Commonwealth. For the first time and in riveting detail, the author illuminates the conditions of one of Canada's forgotten POW camps. Through interviews and meticulous archival research, Zimmermann fleshes out this rich history. 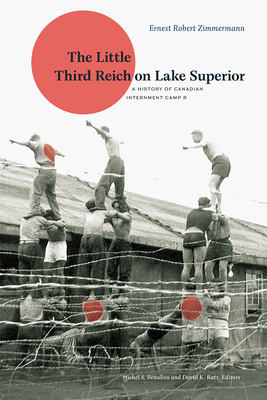 Written in an accessible, lively style, The Little Third Reich on Lake Superior will captivate military and political historians as well as non-specialists interested in the history of POWs and internment in Canada. Born in 1931, in Cologne, Germany, historian Ernest Robert Zimmermann grew up in war-time Nazi Germany. After many adventures and through hard work, he received a doctorate from the University of London, England. He began a long career at Lakehead University in 1967. He passed away in 2008. Michel S. Beaulieu is an associate professor and chair of the department of History at Lakehead University in Thunder Bay, Ontario. David Ratz, a professor in the department of History at Lakehead University, specializes in Canadian military history. He lives in Slate River, Ontario.